2-3 head mounted lasers is also a good option. It’s not like they’re expensive. This has the advantage of indicating position and focus (if all the lasers are hitting in the same spot, its at the focal point). The KISS approach. It worked for the Dam Busters! Predator style. This I like. Better yet, get yourself a cheap laser line level. Extract the laser. Mount three of them and they’ll always cross in the middle no matter the head height. 2 lasers, and use a camera/motors to automatically line them up? “there is an extra lens to clean” – not really. The beam combiner, along with the first mirror, never gets dirty unless the machine is constructed completely wrong. I prefer a pivoted mirror that flips into the beam path for setup and out of the path at other times, scorch made a simple device from an led torch which seems to work well. Cross hair pattern worked fine for me. Line it up on one of the axes and then the other axis might be a little off. I prefer the beam combiner. If you do one yourself you need to give the laser diode vertical and horizontal translation and then the beam combiner on a kinematic mount. Use translation to bounce off the beam combiner where the CO2 beam passes through and then use a piece of thermal paper 10-20 feet away to line up the diode dot and the CO2 beam position. You will lose a bit of power with a beam splitter, a watt or two depending on the power of the laser. But you lose power off each mirror bounce and the lens anyway. I’ve experimented with drilling through the magnet of a large loud speaker, making a hole in the center cone and mounting a lens to it. It works really well for high speed high accuracy focusing. I’ve been tempted to make it 3D or make a version that also has piezo discs for fine adjustments on top of the speaker cone movement but as I didn’t need it I never got around to it. The drilling was slow and a little fiddly. I use 2 line lasers, each mounted 9, degrees apart pointing at the surface to be cut. Because each line in crosses the cut point, and are 90 degrees apart, you always have a crosshair exactly at the cut point. Irrespective of the Z height. Is a combiner necessary? Wouldn’t a flipping mirror like in SLRs be enough? Is there any reason to have both lasers running at the very same time? The flipping mirror is what you’d see on high end lasers. 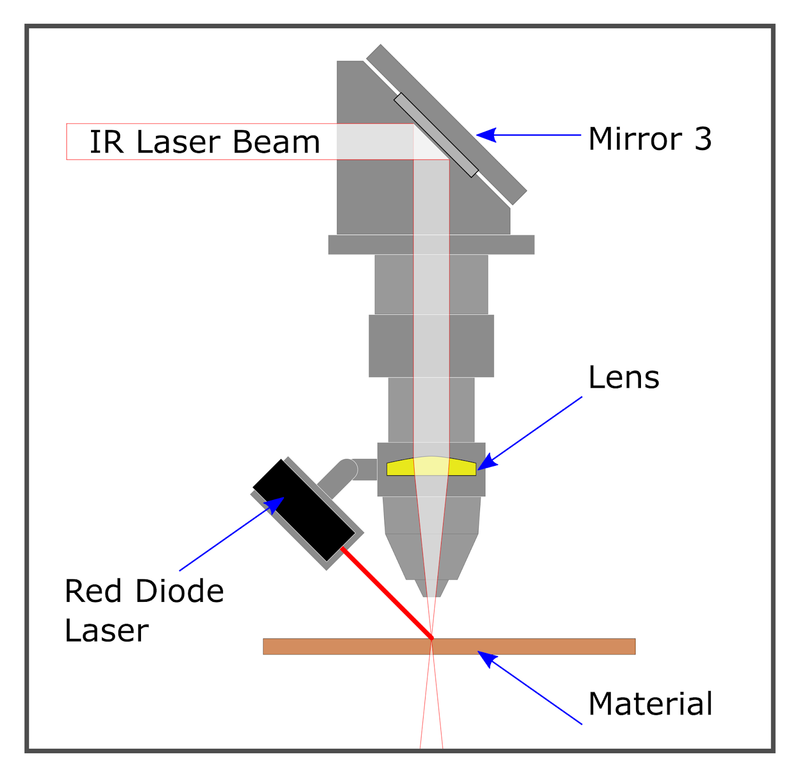 The mirror works as a shutter, deflecting the main laser beam into a liquid-cooled absorber as well as sending a red aiming beam down the path when closed. The other other way to go is to add LED’s around the beam as it enters the main chamber. There are a few examples of this around the place now and since the video i replaced white for RED leds and it works much better. at least with this method you know there are no alignment issues…ever.